Stunning 3 bed villa with its own private pool and gardens. Decorated to the highest of standards and equipped with all the mod cons. Close to the Disney attractions and amenities. This stunning villa is situated in a very convenient location at Indian Wells, a 1.5 minute drive from large Walmart (not to be confused with Walmart on 192 as this is just off 535) and is also within walking distance to the 192, not only this but it boasts being nearer to Disney attractions and Sea world than most other villas. The villa is fully equipped and is spacious and attractively furnished throughout. The comfortable lounge area has a vaulted ceiling and views onto the pool. All patio doors that lead to the pool are alarmed for safety so that small children cannot wander into the pool area without setting the alarm off, the pool area itself is fully screened and the rear garden is fenced, perfect for families. The villa is professionally managed with a friendly and helpful team to make your stay a holiday of a lifetime. Beautifully styled living area featuring cathedral ceiling and views onto the pool. For your comfort a sleeper sofa, a twin sofa and a TV with cable channels and VCR. The dining room adjoins this area and has seating for six. The fully equipped kitchen, complete with cooker, microwave, fridge/freezer, waste disposal, dishwasher, coffee peculator, toaster, in fact everything you need right down to the electric can opener. Table seating for four people with views and access into the pool area. The master bedroom has a king sized bed, dressing table, TV, bedside drawers, hairdryer, walk-in wardrobe and en-suite shower room with his 'n' hers washbasins. The villa has two further bedrooms, one has a queen sized bed and the other has twin beds. The double garage for your convenience when coming and going is fitted with an electric up and over door, with access through the garage into the villa, (especially nice in a tropical storm). The villas are fully air-conditioned. There is also at the villa a washing machine, dryer, iron and ironing board. A cot and highchair can be arranged if necessary. For complete security and peace of mind the villas are equipped with a simple-to-operate alarm system, door peephole and window locks. The gardens are of a good size and laid to lawn. 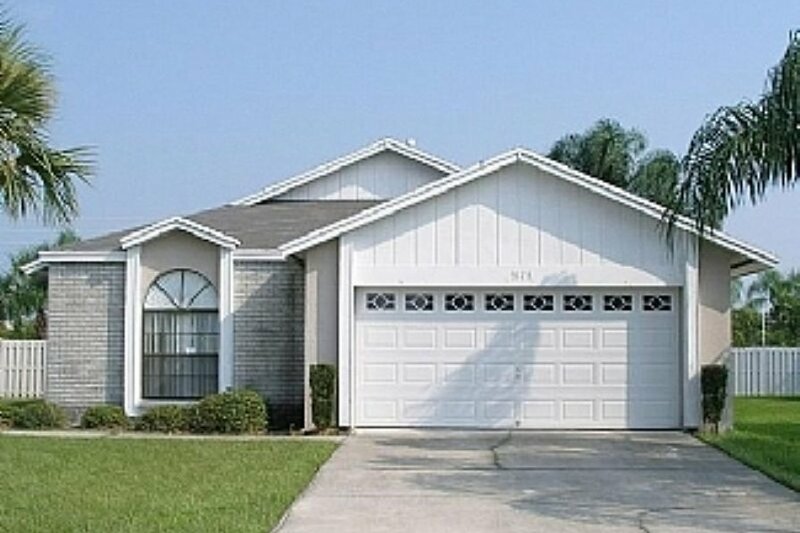 Unlike many Florida properties this property has a fully fenced back garden. The swimming pool, which is screened for added privacy and protection is approximately 30' x 15'. There is also 'in pool' lighting should you fancy a late-night dip. The swimming pool is maintained to a very high standard and serviced weekly. Sun loungers, chairs and a patio table are also by the pool area for your enjoyment and comfort. Pool heating is available during the cooler months at an additional charge. The villa is 1.5 minutes from Walmart Superstore. 2 minutes from restaurants/entertainment on the 192. 3 minutes from top brands factory outlet mall on 535. 4 minutes from fun miniature golf. 5 minutes from Disney Village/Marketplace. 5 minutes from Old Town. 5 minutes from large Flea Market. 6 minutes from Epcot. 8 minutes from Disney water parks. 10 minutes from other Disney attractions.